After being forced to drink the psychoactive substance called Shades of the Evening by his brother Euron, Aeron Damphair Greyjoy has a series of visions centered on the figure of his brother Euron king as a destroyer, slayer of gods and demonic figure. The scene portraied in this drawing is from the first sequence of dreams/visions the character experiences during this particular chapter. 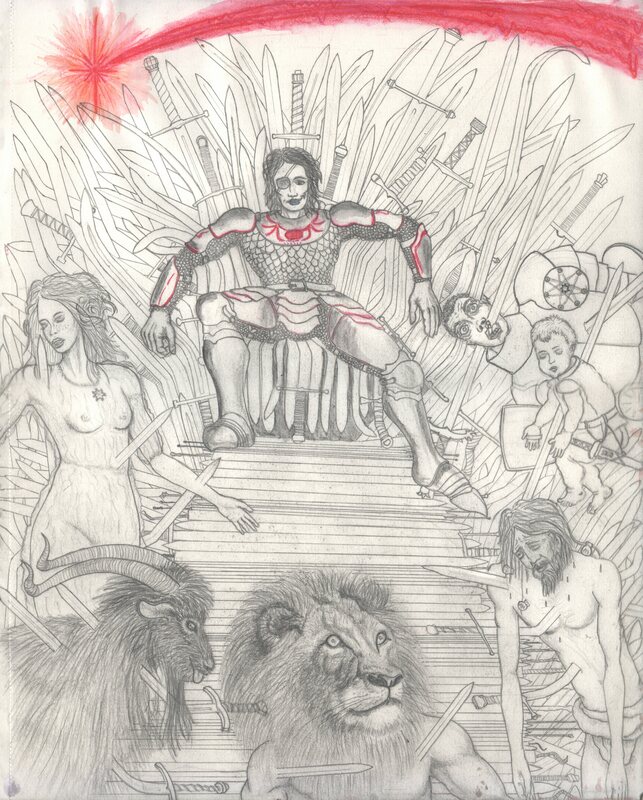 Euron Greyjoy king seated on the Iron Throne; slayer of gods, Crow’s Eye. “Aeron Damphair looked. The mound of skulls was gone. Now it was metal underneath the Crow’s Eye. A great, tall seat of razor-sharp iron of barbs and blades and broken swords, all dripping blood. Impaled upon the longer spikes were the bodies of the gods. The Maiden was there, and the Father, and the Mother and the Warrior and Crone and Smith, even the Stranger. They hung side by side with all manner of queer, foreign gods, The Great Shephard and the Black Goat, Three Headed Trios and the Pale Child Bakkalon, the Lord of Light, and the Butterfly God of Naath, and there swollen in green heft devoured by crabs, the Drowned God festered with the Red Sea Horse, still dripping from its hair. At the end of the chapter Aeron Greyjoy is brought out of the Silence belly, on the deck of the ship, to be tied to the prow; and he assist the preparations for the naval battle his brother Euron is preparing to engage with the Redwine fleet. He sees his brother clad in a valyrian steel armor. “Euron Crow’s Eye stood upon the deck of Silence clad in a suit of black-scaled armor like nothing Aeron had ever seen before. Dark as smoke it was, but Euron wore it as easy as if it was the thinnest silk. The scales were edged in red gold that gleamed and shimmered when he moved. Patterns could be seen within the metal. Whorls and glyphs and arcane symbols molded into steel. Valyrian steel, the Damphair knew. His armor is Valyrian steel. In all the Seven Kingdoms, no man owned a suit of Valyrian steel. Such things had been known four hundred years ago, in the days before the Doom, and even then they would have cost a kingdom. Euron did not lie. He’s been to Valyria. No wonder he was mad. King Euron Greyjoy. by Winter Design is licensed under a Creative Commons Attribution-NonCommercial-NoDerivatives 4.0 International License.